Holbox Island Plan your Visit NOW !!! ! THE price for 2018 Season are here!! Adults (ages 12 and up) $125. Children 4 to 11 are $110 US. No children younger than 3 years nor pregnant women will be allowed as per instructions of the authorities. Email us for private trip costs! Email for more details. holboxwhalesharktours@gmail.com The green waters are the Golf water body near Isla Holbox which is a closer ride from the island, about 45 min - 1 hour while the blue waters are the Caribbean Sea and are farther from Isla Holbox which is about 1.5-2.5 hour trip by boat. The whales migrate between areas, so it is impossible to reserve a green only trip! Please note this 2018 season to allow the big fish a "rest" day no reservations for the 30 of each month will be accepted. Thanks for your understanding! IMPORTANT If you do not receive an email response from us within the next 24 hours, please check your spam or junk mail folders. Often "gmail" can be filtered in this way! Thank you! 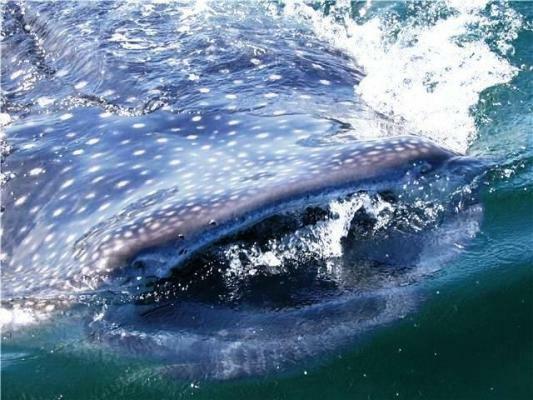 From Early to Mid June through to the beginning of September Isla Holbox is visited by the spotted Whale Sharks. 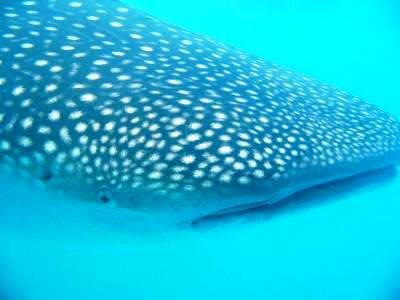 During these months, Holbox whale shark tours which are snorkeling trips out to view these wonderful creatures. 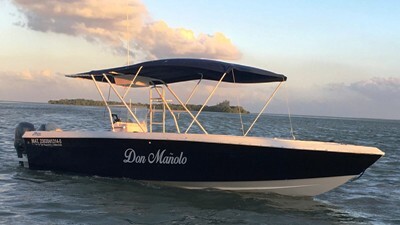 You begin your Holbox whale shark tour with a hour to two hour boat ride out to the viewing area during which you might be lucky to see various types of marine life such as dolphins, manta rays, different fish, turtle. Of course bird life will fly above you as the area near Isla Holbox is also an area favored by many migratory species of birds. Once you find the Whale Sharks, then two by two with your guide you will be allowed to enter the water and observe and snorkel with these massive fish. Holbox whale shark trips depart early in the morning generally between 7:30 and 8 am, and last between 4 to 6 hours depending on the location of the great fish. Space is limited. Reservations are a must. Max on the boat is 10 clients plus captain and guide. For the tour we recommend bringing binoculars if you have them to observe the bird life. If you prefer, feel free to bring your own snorkel, mask and fins for your comfort. Our Holbox Whale Shark tours are operated by Willy's Tours, life long Holbox Island resident with many years of experience in the operation of this wonderful snorkeling adventure. Box lunch with sandwich and some fruit. Beer can be on board, but will only be served once all snorkeling is completed, essentially on the boat ride back to Isla Holbox you can enjoy a cold one! All boats have the required permits for operation and have on board first aid kits, radios, GPS, fire extinguishers, life rings, life jackets. All our guides are certified qualified guides in the marine park, all our captains are certified with many years of experience. All guides and captains are also trained and certified in first aid. Your safetly is our primary concern. Remember the great fish follow their food source, the plankton. Should it be a cloudy day the the plankton is deeper in the water, that is where the sharks will be and not on the surface. 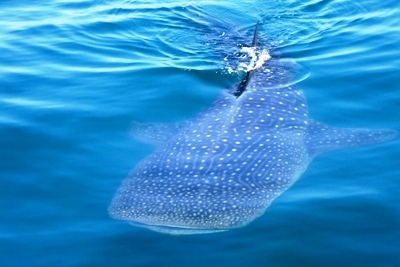 While visiting Isla Holbox don't miss this season's chance to enjoy a Holbox Whale Shark Tour! Contact Us NOW!!! Up front and personal! What a big mouth! Willy's tours booth is located on Ave. Tiburon Ballena ( Main Street) just in front of the store Super Besa located near the town square park and the plaza. ON ISLA HOLBOX SCUBA DIVING IS NOT AVAILABLE.. Here are photos of this great experience! All on board getting ready to enjoy this experience! Tatiana gives a "Thumbs up" to a great snorkeling with whale shark time! 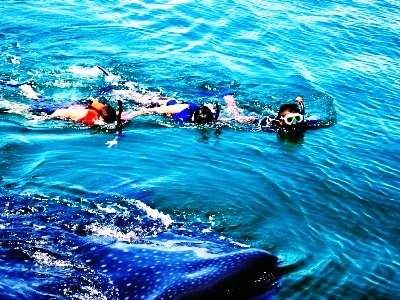 Do to government restrictions, Scuba Diving with the Whale Sharks from Isla Holbox is not permitted. Thank you for your understanding. Below some photos of these huge beautiful fish! Here snorkeling with the whales! 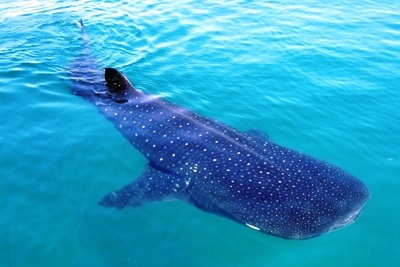 The spotted whale shark "Domino"
For Lodgings on Isla Holbox and other areas visit Hotels and Hostels. We here on Isla Holbox await your visit!! Come see us soon, Friend!! Visit our Face Book page, Willy's Tours Face Book Page! 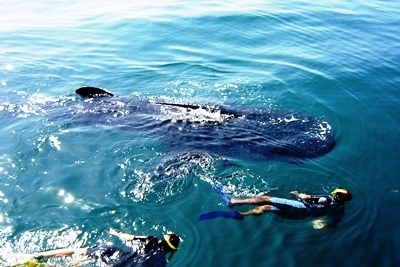 Holbox Whale Shark Tours excitement, adventure, something for you!! All vacation rentals, vacation travel, rental accommodation listings! Vacation diving and holiday packages in dive resorts, on liveaboards, PADI courses, and scuba travel, tours, and trips worldwide. Traveling soon? Need a place to stay? Hotel Contacts has the answer for you. Places to stay, hotels, bed and breakfasts around the world. Information about the global migration of the whale shark Whale Shark Migration. All content, text, photos and layout are the creative design of Amigo's Properties and no part or whole of such can be copied or used with out prior authorization of Amigo's Properties. Doing so will violate appropriate laws and such violators will be prosecuted.01/01/07-09.